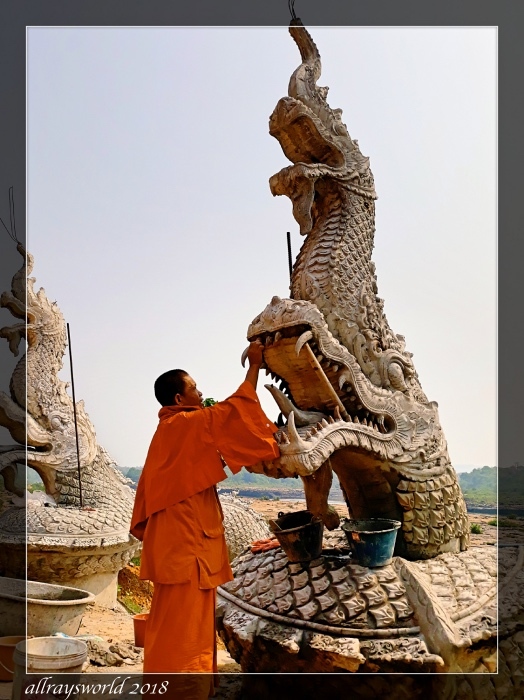 At a set of steps from the temple, down the river bank to the water, I come upon a monk busily engaged in dental work on the brand-new Naga [water serpent]. The monk is in a hurry, as the Naga must be finished, uncluding being painted, before the festival begins...despite this, he is quite happy about my recording of his efforts. Ray: Naga are fascinating mythical beasts, Peter. Ray: Too good an opportunity to ignore, Larry. A nice mini series on his work! Ray: I grabbed the opportunity, Elizabeth. This is quite extraordinary,Ray. To be able to see this monk in action. And that is quite the sculpture. Ray: At some temples the monks are the main artists, Astrid...at others they leave the work to travelling Temple Artist Teams. "Engaged in dental work!" I love it, Ray, and that you were the one to document his handiwork. Ray: I asked his permission, as I could see he was in a hurry, and he seemed quite pleased that I was interested in his artistry, Ginnie. The life of a monk is an interesting and varied one. 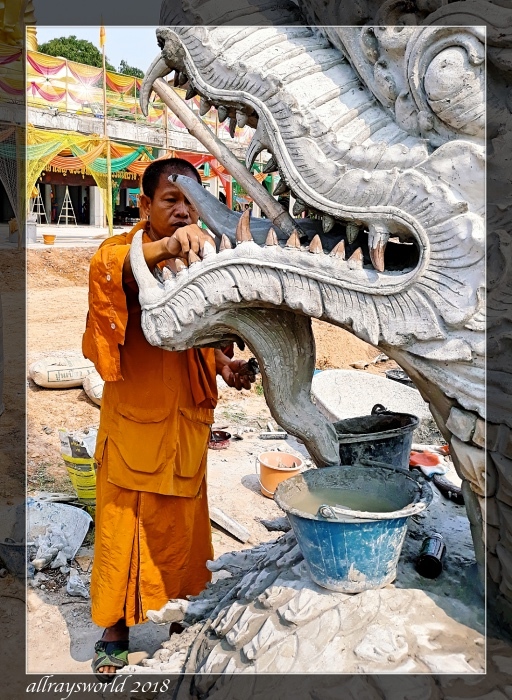 All that abstinence and meditation, then you have to get up early to paint a dragon's teeth..
Ray: I reckon I would enjoy a cold beer after a day of dental work on the Naga, Chris. It's good to see a monk who is not partying. The complex behind him in the third photo looks like some sort fo fairgrounds attraction - perhaps the dodgems. Ray: I suppose the partying comes later, Alan. That building at the back is the platform under the giant seated Buddha in the main image from yesterday...you can see it is almost groaning under the weight of string art. C'est magnifique de voir la precision du travail de ce moine ..la sculpture est très belle ! Ray: J'aime observer les artistes moines au travail sur leurs sculptures de temple, Claudine ... certains d'entre eux sont très habiles. I like your collection of images and to see the dental work on this water serpent! Ray: I enjoyed watching this monk at work, Philine. Ray: If he falls behind schedule, Bill, then they will bring out the floodlights and let him work all night. I do like the prop to hold open the dragon's mouth Ray, so that it does not suddenly snap shut. Ray: Quite right, Chad...if a Naga gets a grip on you then you are in Dire Straits. On dirait qu'il donne à manger au dragon. Ray: Ca ressemble un peu à ça, Martine, mais le moine est en train de donner des dents aux Naga. The sort of job we would call 'a steady little number' . Ray: It is fascinating to observe these kinds of jobs being carried out in the public eye, Brian. And doing a good job, by the looks of things. Ray: The sculpture is turning out well, Tom. I have said so many times, I know, that I would love to work with this stuff. I am really glad to see some close up work. Thanks. Ray: I might be useful for mixing the concrete, and for carrying stuff, but the jobs that require artistry here are well beyond me, Mary. even the Naga is cooperating with his patiently gaping jaws, Ray. Ray: I like the heavy-duty prop in the maw of the Naga, Ayush. A monk dentist at work. If that Naga shuts it's yap the monk's hand will be Deep Purple.